An event celebrating the fantastic achievements accomplished by those involved in the University of Salford led ‘Ideas4Ordsall’ initiative was held at the University’s Old Fire Station on Saturday 12th September 2015. Here is the Ideas4Ordsall group celebrating at the event with Salford’s Ceremonial Mayor Cllr Peter Dobbs (centre). Ideas4Ordsall, which supports the Ordsall community of Salford to develop cultural and creative activities, launched in January 2015 and the event was created to acknowledge its early success. Local people from Ordsall and Islington were awarded certificates at the event by one of the Guests of Honour, Salford’s Ceremonial Mayor Cllr Peter Dobbs, which recognised their achievements in developing their ideas into community activities. 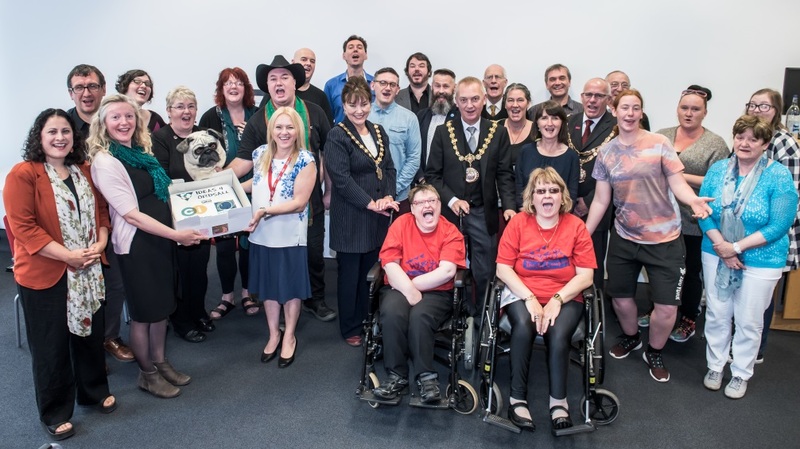 The University of Salford’s Pro-Vice Chancellor for Research and Enterprise, Professor Nigel Mellors and the City Mayor of Salford, Ian Stewart also made guest appearances. Mr Stewart gave a rousing speech which highlighted how the local people had worked creatively in their community to realise their ideas and ambitions. The University of Salford’s Pro-Vice Chancellor for Research and Enterprise, Professor Nigel Mellors (left) and the City Mayor of Salford, Ian Stewart (right). Local ideas range from Rosemary Swift’s idea for an Ordsall Social History play to Shannon Randall’s dog walking service, from Ronnie Crowther’s Ordsall Art Collective to David Winston’s research into WW1 nurse heroine, Edith Cavell. Ideas4Ordsall is funded by the UK Arts and Humanities Research Council (AHRC), and is led by Dr Jessica Symons and Dr Beth Perry from the University of Salford’s Sustainable Urban and Regional Futures (SURF) group in the School of Built Environment (SoBE). It is part of a four-year project on cultural intermediaries in the creative city with partners at the Universities of Birmingham, Birmingham City and City University. Ideas4Ordsall has supported over 20 local residents to carry out community festivals, art collectives, bee hive installations, craft clubs and local history plays, to name but a few. The initiative takes local residents ideas and turns them into reality through the provision of much needed financial and practical support. Named the ‘Ordsall Creatives’, residents have also received support from a range of local organisations including Let’s Go Global, Chapel Street Community Arts, Ordsall Community Arts and local Salford artist, Amber Sanchez. Speaking at the event, Nigel Mellors, PVC Research and Enterprise at the University of Salford, said: “It was great to be able to welcome the Ordsall community onto the campus and celebrate their creativity. Professor Nigel Mellors discussing the initiative with a member of the Ideas4Ordsall initiative. “Ideas4Ordsall illustrates the high commitment to working with local people that the University wants to support. Dr Beth Perry, Director of UPRISE/Sustainable Urban and Regional Futures in SoBE, from the University of Salford, said: “There is so much energy and creativity in Ordsall that we wanted to give people a chance to develop their own ideas. Salford’s Ceremonial Mayor Cllr Peter Dobbs (centre) and Dr Beth Perry, Director of UPRISE Research Centre looking at Ideas4Ordsall’s ideas. “Local cultural organisations and artists have played a vital role in supporting residents to make their ideas happen. Research Fellow Dr Jess Symons spent time in Ordsall getting to know people and then developed ‘Ideas4Ordsall’ to give local people’s ideas a boost. One of the ideas supported is the Ordsall Art Collective. Local resident Ronnie Crowther, a 44-year old father of two who works night-shifts at Sainsbury’s, brought the collective together. They have had a pop-up shop at the Lowry Outlet Mall and will be exhibiting at the Royal Exchange Theatre between 7-27 September 2015. Ronnie said: “There is a lot of artistic talent in Ordsall that goes completely unnoticed and it was my idea to create a platform to get that talent recognised. “The work of the Collective is of a very high standard and we wanted somewhere to say ‘we are here and look at what we can do’. Laura Kendall is a local resident whose volunteering with Ordsall Community Arts has changed her life. Ideas4Ordsall supported Laura to work with Ordsall Community Arts and develop her idea of a community billboard. The billboard is now displayed on Ordsall Community Allotments to let local people know about all the activities taking part in the neighbourhood. Laura said “With the right support I’ve learned how to cope in social situations, I have become so much stronger in myself and I am now very active in my community. “There is so much going on in Ordsall but a huge majority of people just don’t know about it. A full list of creative activities undertaken as part of the project can be found on the Ideas4Ordsall website.